Hello Proplettes and Fake Food Fanatics! I am Ariel Lauryn, your guest poster for the day. I am a Theatre Maker Jane-of-many-trades (I do props, carpentry, painting, puppets, perform, and teach). But back to our topic, a favorite of mine and yours: fake food! Recently, I was out in New York interning with PuppetKitchen (Check them out—no, really. And watch their videos). 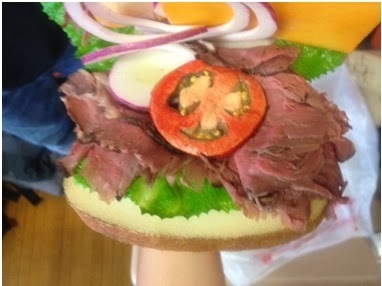 I was granted the opportunity to bring to life a roast beef sandwich puppet, designed by one Michael Schupbach. Here are some pictures! Figures 1 and 2 are photos of the prototype. Figures 3 and 4 are the final product. Note: The bread crust in Figures 1 and 2 is just brown Sharpie on the edge of the Poly Foam Bread. Note 3: And this note may be disappointing to some of you. 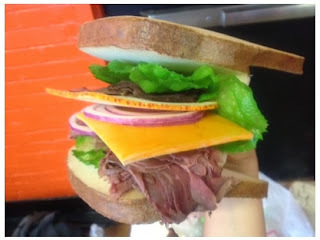 The roast beef in Figures 3 and 4 is real roast beef. Wah-wah. 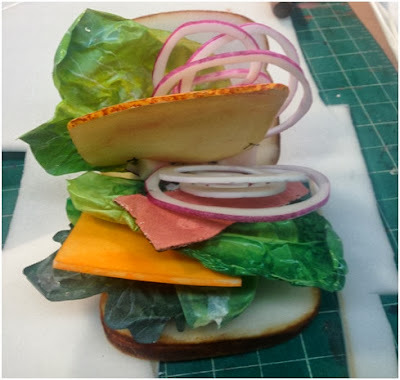 Now, I won’t get into patterning the puppet itself, but I will instead focus on making the individual pieces of food that went into it. 1. 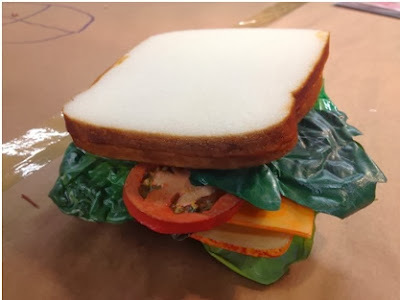 Cut bread shape out of foam. 2. With an airbrush, lightly apply yellowish oxide-y paint to outer edges and a very light dusting over the whole slice. -If you don’t have an airbrush, just do a light dusting coat of spray paint to add some variety to the foam color. 1. Apply a thick coat of Sculpt-or-Coat to the edges of the bread and let dry. 2. Repeat to desired thickness or until the foam texture is covered. 4. Apply a very light coat of Matte Gel Medium or Sculpt-or-Coat. 5. Optional: when application of Matte Gel Medium or Sculpt-or-Coat of Step 4 is still wet, sprinkle on some Corn Meal and lightly press it in. Depending on how much the bread will be moved and manipulated, some of the Corn Meal may flake off. (I was tempted to also try sesame seeds or poppy seeds, but ran out of time). 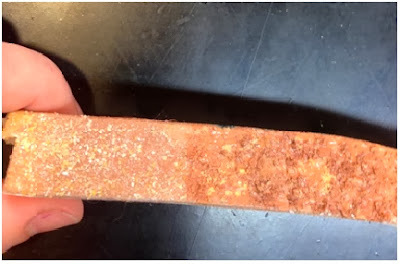 The texture on the left is cornmeal, and to the right is a combination of foam and sawdust painted brown. 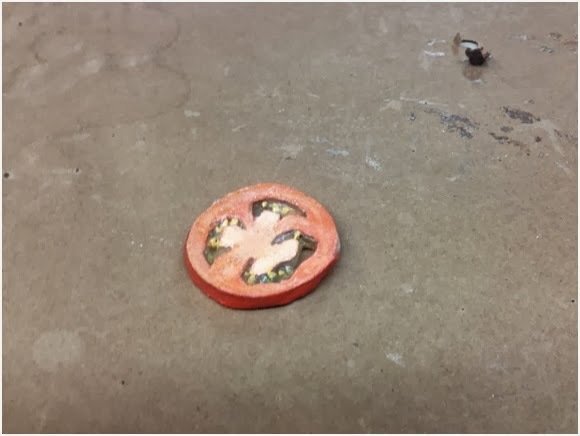 Here’s what I did for the tomato. Now, I don’t recommend this method if you have to make a lot of them. This took a good deal of time, but since this puppet was going to be filmed, detail was of the essence. 1. Cut tomato slice shape out of 1/4” poly foam. 2. Carve out innards to varying depths. 4. Once the Sculpt-or Coat is dry, paint a base coat of pinkish white, slightly darker brownish yellow in the innards. 5. Add any paint detail to Pony Beads. 6. Fill the innards with Sculpt-or-coat. Press in some pony beads for seeds. Set aside to dry. 8. Spray with Clear Coat for glossy shine. 9. Go brag to your co-workers about the tomato slice you just made. Fast, Cheap, Easy—a great combo! 1. Cut out the basic shape of the lettuce you want. 2. Place the steel rod (I used a threaded rod we just had around the shop) down the center of the leaf length-wise. This will create a general shape for the rib of the lettuce. 3. Here’s where the playing comes in: Use the heat gun or blow dryer (a blow dryer takes longer, but might give you a bit more control) to melt the plastic. The plastic will curl up, depending on the heat, the cut of the edges, and how close the gun is to the plastic. Play with the angle that you use to hold the heat gun. I generally had the air blowing from the bottom of the leaf up to the top. 4. Wait for the leaf to cool (it won’t take long) and use a leather glove to remove the steel rod (that will take longer to cool!). 5. Paint! If the leaf is going to move around a lot, lightly sand the plastic. But if you know it will be stationary, I’d recommend not sanding—it will leave your leaf shinier. Speaking of, if you want a shinier leaf, only paint one side. That way, the unpainted side will still have the plastic sheen! 6. 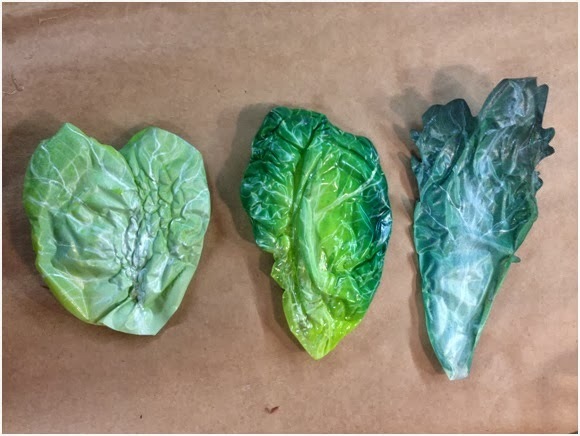 Use varying shades of green spray paint to suit your lettuce. 7. If you want super ultra detail, you can paint on some veins with acrylic or latex paint. Note: These particular onion cuties were made by Daniel Dempsy, a fellow intern at Puppet Kitchen. 1. Cut a circle out of the Plastazote. 2. Cut a spiral in the circle. 4. 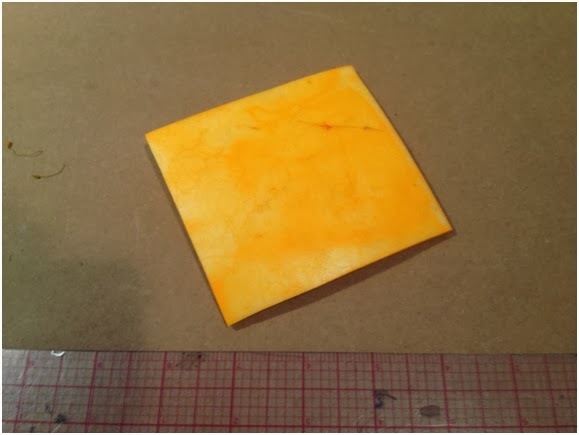 Use the Light Yellow Sharpie to color in the center. Draw in spokes like a bicycle rather than fully coloring it in. 5. 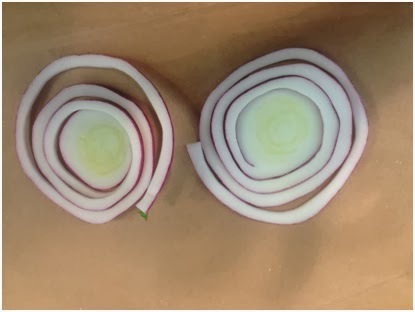 Use Gloss Gel Medium to coat the onion—this seals in the sharpie so it is less likely to rub off and stain the food props around it. Note: The cheese made for this sandwich was made by Jamie Sunwoo, another fellow intern at Puppet Kitchen. 1. Cut out a square of the Plastazote. 2. Paint to your liking. 3. Lightly coat with the sealer of your liking. All photography credits go to The Puppet Kitchen.